You may quickly move to a particular part of the object. To move to a particular part of the object being viewed/​edited, enter the required offset in the Go to Offset field between the buttons. Jump/​offset direction. For example, if you need to find the offset from the object end for a selected byte, switch to the End (backward) option. 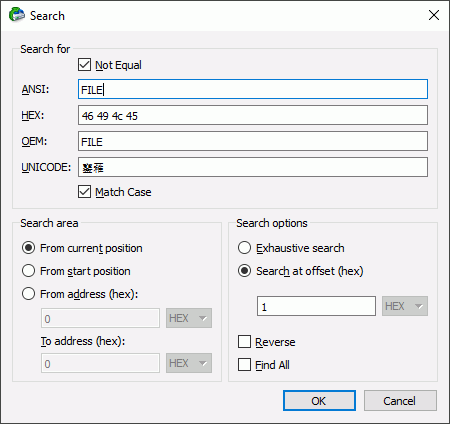 Text/​​hexadecimal Editor will show the search progress. If the Exhaustive search option is selected, the Text/​hexadecimal Editor will stop at the first A character in Sector1 . 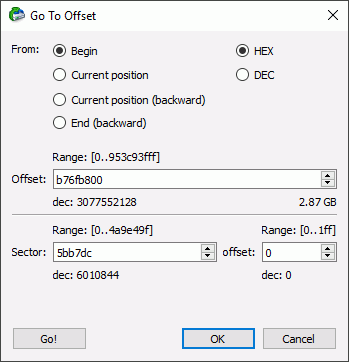 If the Search at offset=0 option is selected, the Text/​hexadecimal Editor will stop at the N character in Sector3 .